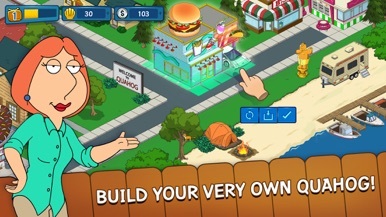 A new dating app takes Quahog by storm, allowing Chris, Brian, and Quagmire to reconnect with their exes. However, their dates get interrupted by desperate singles looking for a hookup. Will our eligible bachelors find true love? Play our "Love Is In the App" event to find out! Published: 2014-04-10, by Peter Warrior. "Is the talking walking dog the only one who's sane in all town?" 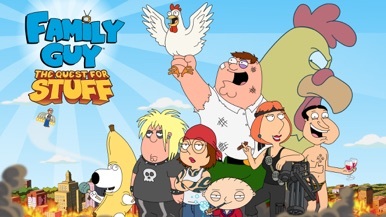 The first you thought about Family Guy when you first watch it on TV was that it was too similar to that other series with yellow characters in. 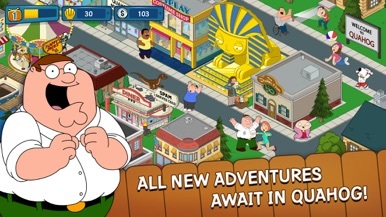 Therefore, nobody should be shocked if the first that will come to mind when you install Family Guy is that its resemblance to the game with yellow characters in is more than a coincidence. And so it is. We could end this review here just by adding it's a pretty good management game with quests in (a la that other game with blue characters in) that starts in a razed city you have to rebuild. 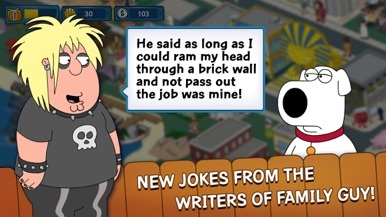 The Griffins and friends bring their characteristic sense of humor (or lack thereof) and some pop-up texts are pretty inspired and may make you laugh, but nothing can stop that feeling that this game asks for a vast amount of time, let alone the more than occasional in-app purchase offers, which aren't anything but cheap. Long story short, a game we would have liked to be bolder, both in content and gameplay. The leveling up and money gathering are really too mainstream and even sometimes makes no sense, and the little if any storyline is based on that chicken who reminds too much of that little pig from the yellow's and it is not fun since long ago. 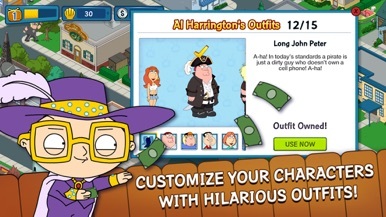 On the other hand, outfits and additional stuff are welcomed, but aren't enough to be considered a worthy fan service, making of this game something that will be more appreciated by casual management players rather than true Family Guy fans. Save your town and protect the castle from the evil queen. Tiny Castle is a management game in which you need to save the family castle from the Evil Queen, by raising magical creatures who will help defeating her. This is a pretty original game besides it apparent simple gameplay. There are many tasks to accomplish, like raising magical creatures,….